Founded in 1989, located in the heart of Downtown San Francisco. Elizabeth’s Flowers San Francisco is a leading popular flower shop and flower delivery service in San Francisco, California. Best San Francisco flower delivery online services by Elizabeth’s Flowers. Elizabeth’s Flowers flower shop and flower delivery services in San Francisco CA. 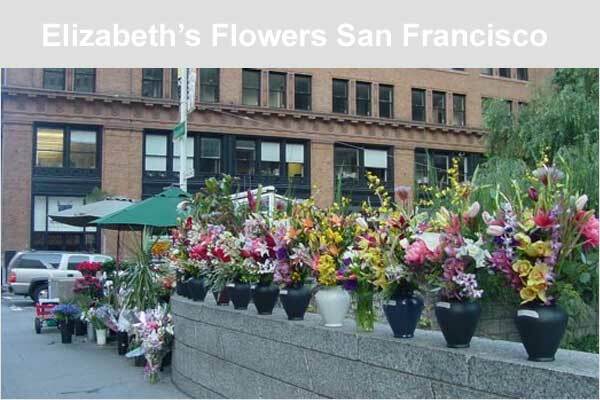 Elizabeth’s Flowers is a family owned and operated full service professional florist offers the finest floral arrangements and gifts in San Francisco and surrounding area. Delivers hand arranged fresh flowers to San Francisco area in California. Member : BloomNation Florist Network. Elizabeth’s Flowers opens Mon-Fri, and closed in weekends and takes same day delivery orders within San Francisco city limit until 2pm PST. For the fastest same-day delivery, place your order online. Please allow 2-4 hours between ordering and delivery. Delivery fee is $15 within San Francisco city limits. Delivers between 9am and 5pm Monday through Friday. (unless 5pm-7pm evening delivery window is requested). 1 Bush Street San Francisco, CA 94104, USA.